Falcon International Reservoir continued to solidify its status as one of the prime big-bass lakes in Texas March 9 with a 13.56-pound largemouth that became Toyota ShareLunker 517. Jason Shropshire of Cleveland, Texas, caught the fish about 8:30 a.m. in 22 feet of 70-degree water using a Senko. The fish was 25.125 inches long and 21 inches in girth. It was weighed and held for pick-up at Robert's Fish 'n Tackle, an official Toyota ShareLunker weigh and holding station in Zapata. The fish is being held at the A.E. Wood Fish Hatchery in San Marcos pending the results of genetic testing to determine if it is pure Florida largemouth or an intergrade having both Florida and northern largemouth genes. If it is 90 percent or more Florida, it will be moved to the Texas Freshwater Fisheries Center (TFFC) in Athens and spawned. If it has less than 90 percent Florida genes, it will be returned to Falcon as soon as possible. All anglers who enter ShareLunkers into the program receive a fiberglass replica of their catch and ShareLunker clothing and are honored at the annual ShareLunker banquet regardless of whether their fish is used for spawning or not. After years of low water level during which brush and other vegetation grew up in the dry lake bottom, Falcon rose in 2004 and completely filled in 2008 and again in 2010. 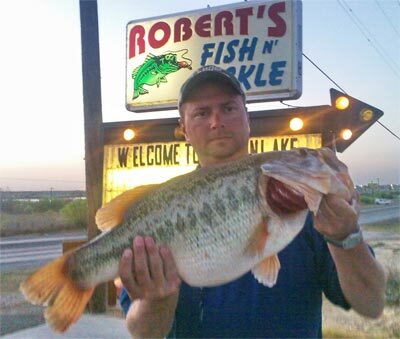 "There was tremendous bass production in 2004 and 2005," said Texas Parks and Wildlife Department (TPWD) inland fisheries biologist Randy Myers, who manages the lake's fishery. Fish spawned during those years had ample food and places to hide due to all the submerged vegetation and are now reaching the age at which they have had time to grow to 13 pounds. Shropshire's fish is the thirteenth entry into the Toyota ShareLunker program this season and the fifteenth entry from Falcon. Falcon ranks sixth among Texas reservoirs in ShareLunker production, following Lake Fork (246), Alan Henry (25), Sam Rayburn (23), O.H. Ivie (22), and Conroe (16).